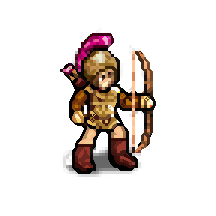 Even if a small part of the Calydonians chooses to use the bow and become a Toxotes, the Calydonian army often needs better trained archers. In these cases, Strategoi usually recruit some Cretan mercenaries: the island of Crete is well-known for its skilled archers, who use their bows with a deadly precision. Last updated on Sat Apr 20 01:32:29 2019.